Remote climbtoKitt Peak National Observatory. This is an isolated climb in southern Arizona, about 40 miles southwest of Tucson, not far from the Mexican Border (Sasabe), rising out of the Sonoran Desert. 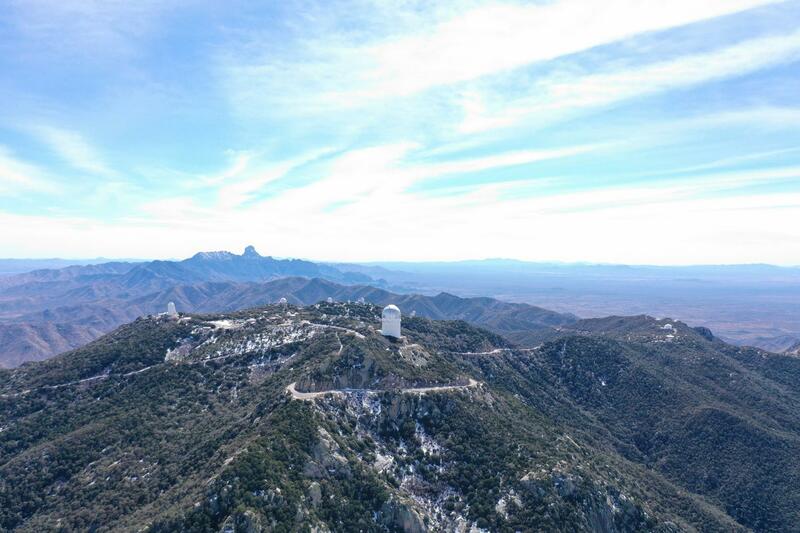 Kitt Peak National Observatory is an astronomical observatory southwest of Tucson in the Quinlan Mountains. Water, candy and chips can be found at the Visitor Center 12 miles up. The climb begins with moderate grades that give way to several quarter mile stretches at 9-10% mixed in with 5 and 6% quarters for the last two-thirds of the climb. When we climbed Kitt Peak on February 28, 2015, the weather was mild at the bottom but absolutely howling at the top -- the wind speed is dramatically higher at the very top of this climb than throughout the first 12 miles (which were windy, but not the devastating gusts that were downright spooky at the top. We were blown back trying to take photos at the observatory at the summit. The views are classic Arizona high desert -- the mountains, rock formations and plains below reminiscent of a John Ford western. Dramatic views of the Arizona plains. We generally have the road to ourselves on this bike climb. First eight miles of the climb on the northwest side of Kitt Peak. Last four miles after turning the corner at mile 8.5 and riding on the southeast side to the top. You don’t have to guess at your elevation. Mile Marker 12, the last one before the summit. 2.3m telescope (front) and Mayall 4m telescope (rear). Top of the ride -- Visitor Center, mile 12. Left: Visitor center, Kitt Peak National Observatory and various telescopes. In the distance to the right: ARO 12m Radio telescope and MDM Observatory. Roadway Surface and Traffic: The roadway is in very good condition throughout the climb, with minimal traffic the entire way. Thank you for your contributions Bruce Hamilton, La Quinta, CA, USA. Cycling Kitt Peak - Arizona's third most difficult bike climb. This is a long climb to an observatory along a remote and quite roadway.